Your own personalized nameplate produced to suit your taste! We offer a host of personalized name plates to spice up your office. Choose a special nameplate for your boss on "Boss's day," or give your entire team their own special personalized nameplates or simply choose the one that suits you best. Emphasize your corporate branding by incorporating your company logo, slogan and name in the design. A (400x150 mm) the Summit type. Any logo or text can be engraved, a black and white drawing of your design is produced, and is used to engrave either a brass, stainless steel or acrylic nameplates. Send your own layout and design and choose from the different available finishing schemes and sizes. 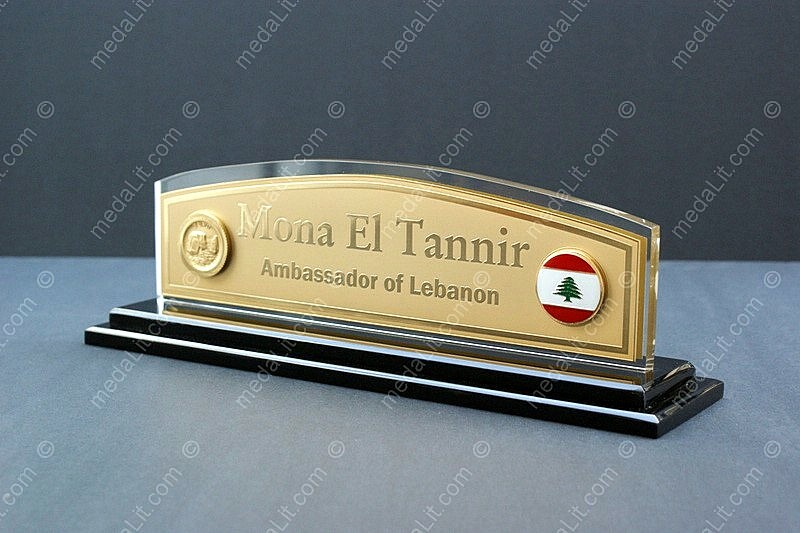 Metal nameplates are engraved from 0.6 or 1 mm thick sheets in a process that offers very precise high-quality engraving. All metal plaques receive clear protective coating. Acrylic (Plexiglas) nameplates are laser engraved from 10 mm thick crystal clear transparent acrylic sheets. (Although can be ordered to be either crystal clear or black). Engraved areas appear milky white on crystal clear surfaces. Alternatively, engraved areas can be color filled. The color of the wood frame of the nameplate is vengé (very dark brown). All nameplates are packed in a carton box. Medals produced to fit can be added according to customer request and require an additional charge. Can be decorated with extra medals.